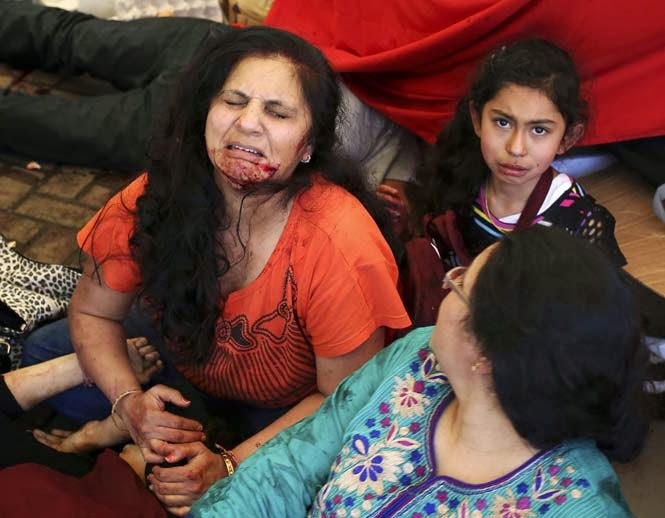 Islam Around Us: Kenya mall hostage crisis continues, toll 59 . New Delhi | Nairobi | 22 Sep 2013 :: Kenyan troops were locked in a fierce gunfight with Somali militants inside an upmarket Nairobi shopping mall on Sunday, in a final push to end a siege that has left 59 killed and 200 wounded with an unknown number of hostages still being held. Israeli forces joined Kenyan efforts to end adeadly siege by Somali militants at the mall, a security source told AFP. "The Israelis have just entered and they are rescuing the hostages and the injured," the source said on condition he not be named. The intervention came 26 hours after gunmen walked into the complex, tossing grenades and spraying gunfire at shoppers and staff. Fifty-nine people are confirmed dead in an attack by Somali Islamist militants on a Nairobi shopping mall, Kenya's interior minister Joseph Ole Lenku said on Sunday. Some 10 to 15 gunmen are still battling security forces inside Nairobi's Westgate shopping mall, he said. "A number of attackers are still in the building, and range between ten to fifteen gunmen," he said. "We believe there are some innocent people in the building, that is why the operation is delicate."